Here's a brand new slot game from Microgaming with some really nice features and amazing gameplay. Adventure Palace is one of the best slots on the market currently, you really need to try it out for yourself today. You can also find all our online slots here! Ever wondered where the online slot casino era started? We know all about it and we can say that you are in good hands with this one, as Adventure Palace slot game was designed by one of the pioneers in online casino gaming. Microgaming was the first company that introduced the online casino and gave us the opportunity to play gambling games without leaving the house. 20 years have passed and now Microgaming online casinos take their well-deserved place among the most popular online casinos in the world and will be sure to be a favourite developer among our players. So, check out our slot games online today at Wizard. Safari time! Join the funky bunch of animals for a fantastic experience in the jungle with this amazing 5 reels online slots game from Microgaming game development company, Adventure Palace. Jump in the middle of the savanna and get a glimpse of the exotic life you are going to afford after winning the amazing prizes this game has to offer. Well, you may find out more about our best games in terms of themes! With only 9 paylines, this slot game turns out to be an ideal title for everyone, with lots of bonuses such as free spins and multipliers to get you excited. By means of design, this one is not too shabby, but contrary, I would say that there has been enough attention paid to achieving a neat and cheerful design that delivers exactly what’s needed to create that exotic atmosphere this game is based on. Don’t get yourself lost in the jungle, as there are all sorts of creatures that are craving for your flesh unless you get along with our 6 helpful friends that are here to keep you safe and rich at the same time. Let’s meet the 6 animal symbols that are by your side in this jungle trip, the tiger, the monkey, the peacock, a pair of birds, a snake and the mighty elephant that can bring you the jackpot of 10.000 credits if you land on 5 of his symbols. The wild in this game is represented by the elephant symbol, that will substitute for any other symbol, and will also double the payout amount that is usually awarded for the filling in a symbol. 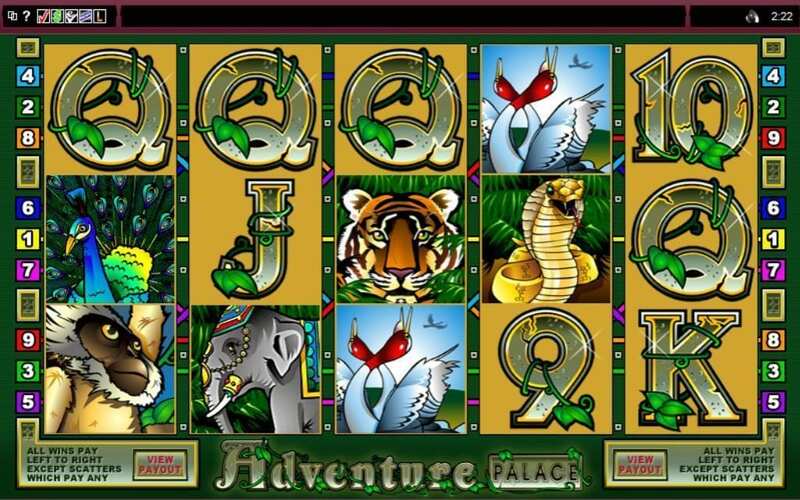 That is not all, as there is one more symbol that is represented by the logo of the game itself, Adventure Palace, that represents the scatter in this slots game and can bring you rewards regardless the position where it lands on the reels, as long as you hit at least two of the symbols. Not only that but also, the scatter brings you 15 free spins whenever you land on at least 3 of its representative symbols. During this free spins fever, all your earnings will be tripled. Last but not least, if you feel like being in your prime time when it comes to being lucky, you can test your luck with this amazing gambling feature that this game delivers.